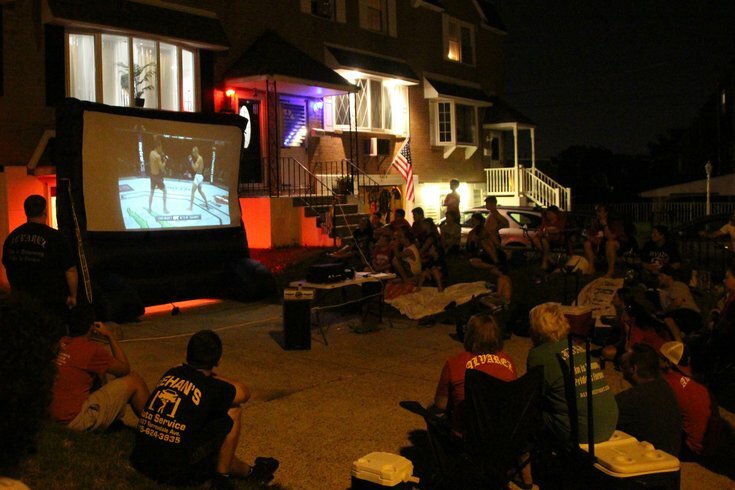 Eddie Alvarez's family and friends gather on his street in Northeast Philly to watch the 32-year-old Kensington native with the UFC lightweight title. Some day – whether on his own terms or someone else's – Eddie Alvarez will no longer wear the belt. But no one will ever be able to take away the fact that the Kensington native became the first Philadelphian to win a UFC title on Thursday night with a stunning first-round TKO of heavy favorite and reigning champ Rafael Dos Anjos. In doing so, he also became the first MMA fighter to have won a title in each of the sport's largest two promotions; prior to joining UFC, Alvarez twice won the Bellator Lightweight Title. Thousands of miles away from the Las Vegas octagon, Alvarez's family and friends – including his parents and his four children – gathered on the Northeast Philly street the fighter calls home to cheer him on. When the 32-year old is fighting closer to home, like he did in January when he beat Anthony Pettis in Boston, they'll make the trip. But when he's on the other side of the country, they set up shop outside of neighbors Tom and Crystal Wallace’s house. There was beer in the coolers, a drone flying overhead and even a visit from Mister Softee that would provide the sugar rush the kids in attendance needed — or, more likely, didn’t — to stay awake to watch the lightweight title bout. A fellow North Catholic grad, Wallace was part of the large contingent that traveled up to Boston to support Alvarez earlier this year and, according to those at the fight, took over the arena. But on Thursday night, they had to settle for Plan B. And after hours of waiting and what seemed like countless undercard fights, it was time for the main event. Because it was a weeknight, the crowd was smaller than at previous parties, but the stakes were even higher. Chants broke out every time Alvarez was shown on screen and when it came time for his entrance, well, the crowd went wild. A few minutes later, that anticipatory excitement would turn to pure, unfiltered jubilation that had to wake up at least a few neighbors who had already gone to bed. The celebration likely lasted longer than the fight itself, which was stopped after just 3 minutes and 49 seconds. And the show of support from family and friends is just one part of Alvarez's long journey to the peak of his profession. But if you ever talk to Alvarez, his family, or anyone who knows him outside of the octagon, it's by far the largest part. Need proof? Just look at what Alvarez has been able to do since moving back home after spending a few years in Florida training -- he's won all three of his fights after losing his UFC debut and can now call himself champion. "They've got a tight-knit street here," said friend Kevin McCormac. "And Eddie's about fighting and family. And family's first." "He's just a really down to earth dude," added Dave McKenna, a Morrell Park native. There's something so very Northeast Philly about this kind of kinship, something that's hard to explain unless you've lived there. In a world full of doubters, haters, whatever you want to call them, this is Alvarez's support system. And they never doubted the underdog's chances at becoming Philly's first UFC champ. But not even the most optimistic fans -- his parents -- saw it going quite this well. "I thought he would win, but I didn't expect it to be like that," his mother, Lillian, said while fighting back tears. "I overwhelmed, but at the same time relieved and relaxed." Prior to the fight, both parents said they don't get nervous when watching their son fight. His father, who passed on both the bloodline and the backbone to help make his son a champion, admittedly watches his fights with a more critical and analytical eye, something he attributes to being an artist and seeing things differently than most. But in the less than four minutes of action -- in which Alvarez was barely touched -- there wasn't a whole lot to critique.